Astley Pipe Tobacco started in 1862 at 109 Jermyn St as both a brand name for their exquisite pipes as well as a leading London tobacconist. Astley Pipe Tobacco is made from traditional English recipes developed in one of England’s most time-honored and storied tobacconists. 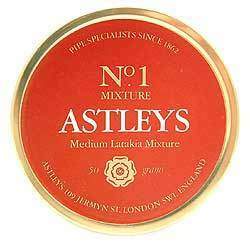 Although it hails from England, Astley pipe tobacco has a unique taste that any American would love – it’s smooth, with no harsh aftertastes like some of their better known competition.